Endemic to Lake Malawi. It occurs in the northern part of the lake, between Cape Kaiser and Lundo, and also from Chirmbo Point to Charo. The “electric yellow” morph has been recorded only between Charo and Lion’s Cove. L. caeruleus inhabits two distinct biotopes in the lake, occuring in both rocky areas and also in heavily vegetated beds of Vallisneria. L. caeruleus will accept most foods offered but vegetable matter in the form of spirulina flakes, blanched spinach etc. should form a large proportion of the diet. This can be supplemented with live and frozen varieties..
A relatively peaceful species ideal for many hard water communities. Ideally, it should be kept in a Lake Malawi biotope aquarium with fish such as peaceful Haps. It can also be combined successfully with hard water rainbowfish and some Cyprinids. It can be maintained in groups but does become territorial when spawning. Males can also be quite vigorous in their pursuit of mates, so we recommend keeping several females to each male. It can also be combined with other mbuna. 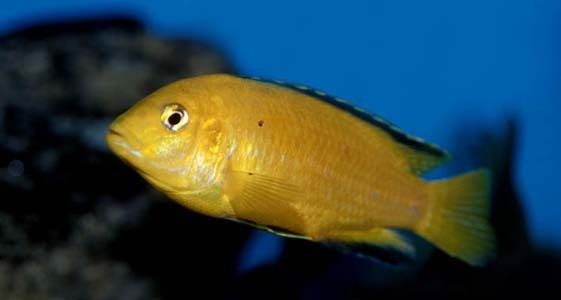 If it is kept in a mbuna community, the tank should be overcrowded to reduce aggression and territory formation. Adult males tend to be somewhat larger than females and develop brighter colours when spawning. They may also develop more black pigmentation in the fins although this is an inconclusive method of sexing. The female may carry the brood of 5- 30 eggs for up to 3 or 4 weeks, before releasing the free swimming fry. She will not eat during this period and can be easily spotted by her distended mouth. If a female is overly stressed she may spit out the brood prematurely or eat them, so care must be taken if you decide to move the fish, in order to avoid fry predation. It is also worth noting that if a female is away from the colony for too long she may lose her position in the pecking order of the group. We recommend waiting as long as possible before moving a female, unless she is being harassed. Some breeders artificially strip the fry from the mother’s mouth at the 2 week stage and raise them from that point as this usually results in a larger number of fry. This species is one of the most popular Rift Lake cichlids in the hobby, due to its striking colouration and somewhat peaceful (for a mbuna) nature. It exists in many different colour forms in nature, and the ubiquitous “electric yellow” morph, so popular in the hobby, is actually one of the rarer forms in nature, with the blue and white variety being more widespread. Wild fish are correspondingly rare in the hobby, with the vast majority of specimens offered for sale being tank-bred. The different forms (and other Labidochromis species) should not be mixed in aquaria as they may hybridise. L. caeruleus was originally imported under the name L. tanganyicae. This is thought to be because the first captive bred specimens were bred in a facility at Lake Tanganyika. It is the ideal beginner’s mbuna.